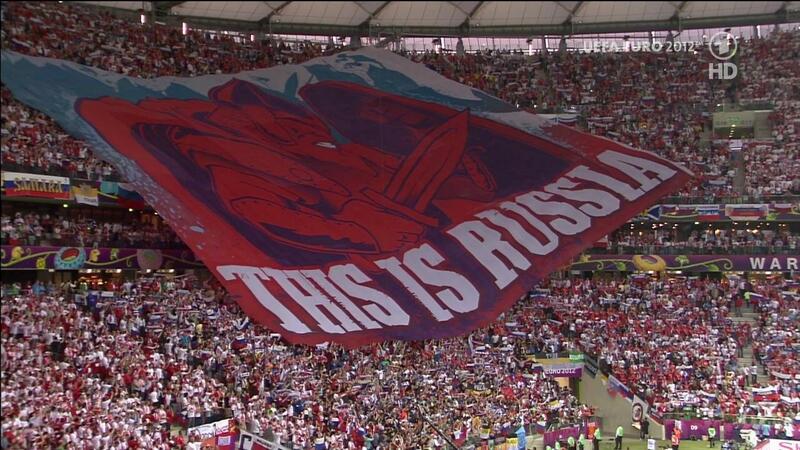 The National Stadium in the Polish capital of Warsaw was the stage for Russia vs. Poland. 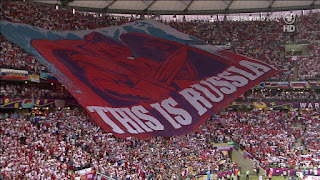 Russian fans arrived to the stadium in force after pre-match attacks from Polish hooligans, unveiling a massive banner declaring "This is Russia" over a large section of supporters minutes before kickoff. The Polish home crowd buzzed with anticipation while their underdog side sought victory against the group favorites. The home crowd almost had the start they desired just seven minutes into the match. Rafal Murawski's free kick on the right flank sailed into the box and was met by the head Sebastien Boenisch, but Russian keeper Vyacheslav Malafeev was in position to make the save and the early chance was cleared. A minute later, Boenisch forced another save from Malafeev off a headed corner. The Russian keeper's positioning and reactions served him well in the early going and Malafeev made it clear from the start that it was going to take something special to beat him. Poland piled on the pressure early in the match, hassling the Russian midfield that had overrun the Czech Republic with ease. Their pressing efforts were nearly rewarded when Eugen Polanski fired home a shot from the edge of the area, but the goal was called off because he had received the ball in an offside position. The early stages of the match were being dominated by Poland, but the Russians managed to turn the game back in their favor as the match approached the half hour mark. Russia was granted a free kick in the 37th minute that allowed them to find a breakthrough. Andrei Arshavin took curled in the free kick from the left flank that was met by the streaking young goalscorer Alan Dzagoev. The ball flicked off the midfielders head into the far corner of the goal, earning his tournament leading third goal of the tournament. It was Andrei Arshavin's third assist of the tournament, he now sits fourth all time in assists at the European Championship. The Russian defense remained standing, but became increasingly unstable following the halftime break. The play began to go from end to end rapidly, with the superior Russian midfield making their presence felt. Aleksandr Kerzhakov continued his wasteful form, compromising several Russian forays into Polish territory with poor passing, and the Russian striker increased his record as the least accurate shooter in tournament history. Ultimately though it was a gaffe from Andrei Arshavin that would sink Russia's hopes of victory. Arshavin's untimely givaway in the attacking area led to a Polish counter-attack. Polish captain Jakub Blaszczykowski received a pass on the left flank and made a cut inside the penalty area with his first touch before firing in the best strike of the tournament thus far. The on point keeper Malafeev was helpless to stop the perfectly placed shot. Following the equalizing goal, both sides were able to force saves from the opposition keeper, but neither was able to break through thanks to great displays by both goalkeepers. Malafeev earned the honor of Man of the Match thanks to his six saves allowing Russia to escape the match with a valuable point. Robert Lewandowski was influential throughout for Poland, narrowly missing several opportunities and annoying the Russian defenders throughout. Both teams are now level at the top of Group A with 4 points each, Russia hold the top spot on goal differential. Russia still have to be the favorite to win the group, although it will take a victory over Greece in order to advance. Poland will now face the Czech Republic where a draw will be good enough to see the co-hosts through to the knockout stages.